Colorverse String is one of the more impressive shaders I've seen. Huge change in colour and brightness. At it's darkest it's a yellow bronze colour and at it's lightest it's a soft gold-yellow colour. Very impressive. There is the slightest hint of green but it isn't strong. It's a very wet ink. It takes a while to dry on Rhodia and Tomoe River but it's nice and smooth to write with at the same time. There's no sheen on the written line but where the ink pools on a very heavy ink swatch there is a slight silvery sheen. In these same spots where it pools very heavily the ink also brings out a rusty red colour somehow. Colorverse Brane is an olive green ink with a nice amount of saturation to it. It's a happy vibrant ink. There's some nice shading with this ink; not as much as with String but still very capable in it's own right even on 52gsm Tomoe River which tends to flatten inks a little. There's a subtle silver sheen that's visible on Tomoe River even on the written line that compliments the blue and/or green (it's difficult to tell!) shimmer that is in the ink. The shimmer itself is also fairly subtle; it's much less prominent than the shimmers of Diamine or J. Herbin. The shimmer here is also not silver or gold but slightly blue and/or green which works surprisingly well with the yellow-green base ink colour. The ink isn't nearly as wet as String and in general I wouldn't call it very wet. More neutral (so wetter than Montblanc or Pelikan). The chromatography of String is interesting because it's difficult to see where the dark brown comes from. There is a low-saturation grey-green that moves to a yellow-orange and finally to just a yellow. 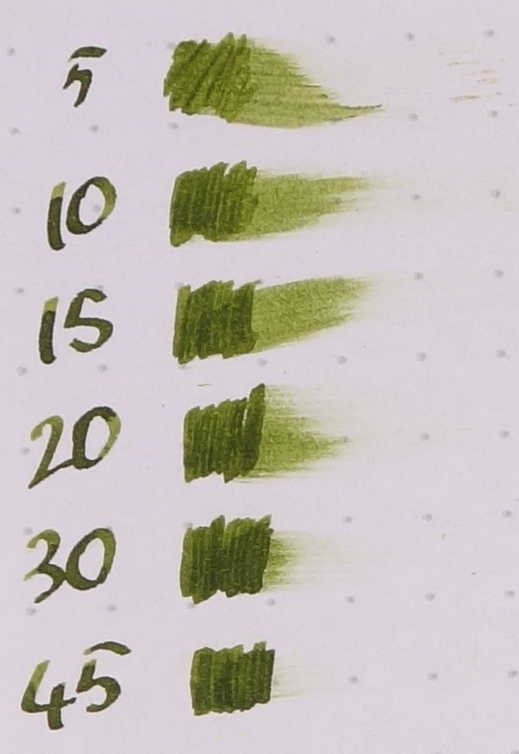 At 60 seconds for Rhodia and 240 seconds for Tomoe River this ink is extremely slow to dry. 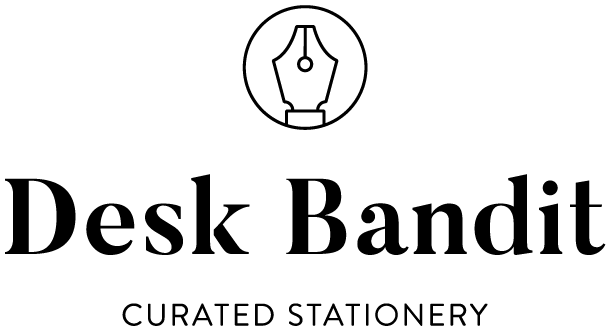 In an EF nib it might be more respectable but certainly not in any nib with heft. 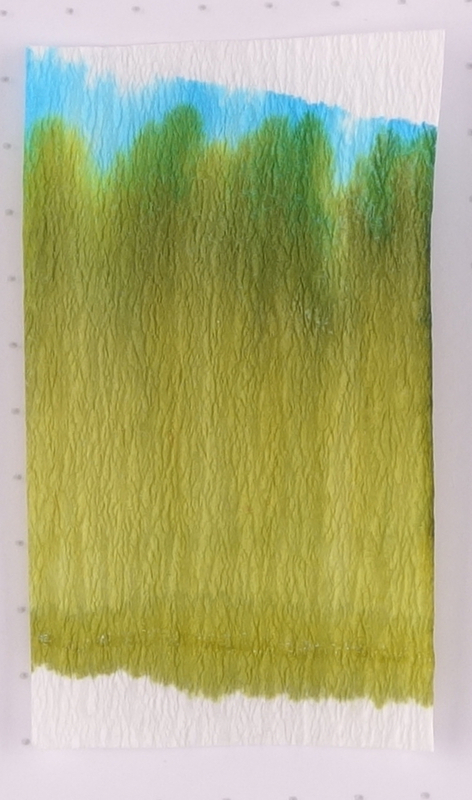 The chromatography of Brane starts with a pale green moves eventually to a darker "proper" green and then finishes abruptly with a straight turquoise. Interestingly dry time was the same on Rhodia and Tomoe River (so slightly slow for Rhodia and slightly quicker for Tomoe River). The fat wet 1.3 stub nib of the Visconti Homo Sapiens really brought out the shading in the ink. There's still shading with the JoWo Fine nib but not as much. This is interesting because in my experience wetter nibs tend to shade less. There's some grey visible under the water resistance tests but not in any meaningful way. (The left is dabbed with a tissue fairly quickly and the right test was left for a short amount of time). Louis Vuitton or Audacieux is less saturated and less yellow and has very little shading. Noodler's Golden Brown is very similar but still noticeably flatter and the performance isn't great though it does share the golden colour with Colorverse String. KWZ Honey is greener, darker and has less shading. Toucan Sienna is too orange. Robert Oster Caffe Crema is too dark and orange-red. Kingdom Note Chrysaora helvola is too bright and orange and Akkerman #22 Hopjesbruin is also too orange. Noodler's Golden Brown is definitely the closest here. The shading of the JoWo is a little more prominent here and the shading from the Visconti is also still rather high which is good for Tomoe River. Louis Vuitton has had it's saturations sapped from it like Tomoe River sometimes does with inks. Golden Brown's yellow has become more orange/ KWZ is Darker with less shading. Toucan Sienna hasn't changed much. Robert Oster Caffe Crema has some nice shading now but still not as much as Colorverse String. Kingdom Note Chrysaora helvola is way too bright and orange as is Akkerman #22 Hopjesbruin. There is comparable shading between the gold-nabbed broad italic (ground by Mike Masuyama) and the Fine JoWo nib. There is very little left of the ink after a water resistance test. Nothing remotely water resistant here. (The left test is dabbed with a tissue fairly quickly and the right test was left for a short amount of time). Robert Oster Jade is far to green. Diamine Safari is darker and less saturated. Maccha Yokan is a similar hue but way too dark. Montblanc Defoe Palm Green is fairly similar but not quite as saturated. Kobe Chaska is too brown and dark. Rohrer & Klinger Alt-Goldgrün is slightly less saturated and a little too light. Kyo-no-oto Kokeiro is much lighter but a similar hue. Tanna Japonensis is a similar hue again but too dark. The closest would have to be a combination between Rohrer & Klingner Alt-Goldgrün representing the lighter shaded areas of Colorverse Brane and Kingdom Note Tanna Japonensis representing the darker shaded areas. On Tomoe River the shading isn't quite as strong though it does still shade nicely. A little more shading with the Masyuama Broad Italic on the Lamy. Not many changes from on Rhodia. Montblanc Defoe Palm Green had a little of the saturation stolen away by Tomoe River as has Rohrere & Klingner Alt-Goldgrün and Kingdom Note Tanna Japonensis to small degrees. But overall the comparisons mentioned above apply here still. I'm quickly becoming a fan of Colorverse inks. They are nice a wet which is what I love, the sheen (though not these that much), and their use of shimmer, which I rarely ink a pen with, is subtle, nice and unique. String is showing the variety you can get out of Colorverse with it's super shading qualities which contrasts to the other offerings from the brand such as high sheen or a flatter ink with little or no sheen. Plenty of colours as well. The dry time of String could be a bit of a worry to some but the shading is very impressive. The colour of Brane isn't hugely unique but it's a good execution and the shimmer is subtle and unique which I appreciate. Colorverse ink are available many international shops these days. I bought these bottles from The Desk Bandit in my home town (they do ship internationally, have a free shipping threshold and a 15% off code for new subscribers to their newsletter).